Unscrolled: Reframing Tradition in Chinese Contemporary Art has become one of Vancouver Art Gallery’s most buzzed about exhibits. The show features the work of contemporary Chinese artists who through a multitude of different mediums explore their ancestry and heritage through their contemporary context. The exhibit was co-curated by assistant curator Diana Freundl and Beijing art critic, Carol Lu; it is being shown from November 15th 2014 – April 6th 2015. Ai Weiwei. Bang, 2011. 886 antique and replicated stools from the Qing dynasty. Courtesy of Deborah Poh. On an abnormally warm Sunday in February I decided to see the show after hearing a lot about it from both friends and social media. The Vancouver Art Gallery has in-house family activities and people of all ages can be seen walking along the corridors and contemplating the art around them. Therefore, this show will be seen by a variety of different people. This makes the artworks featured at the gallery both accessible and curated with the general public’s interests in mind. On this particular day the gallery was quiet and I was often the only one that could be heard talking about the art to my accompanying friend in the showrooms. With that in mind, Unscrolled does not shock or confuse its viewers, rather it affects them by putting the ordinary or everyday of a past generation as the central topic in order to comment on a present consumerist culture. The artists I was the most drawn to in the exhibition were Ai Weiwei, Liu Jianhua, Chen Shaoxiong. 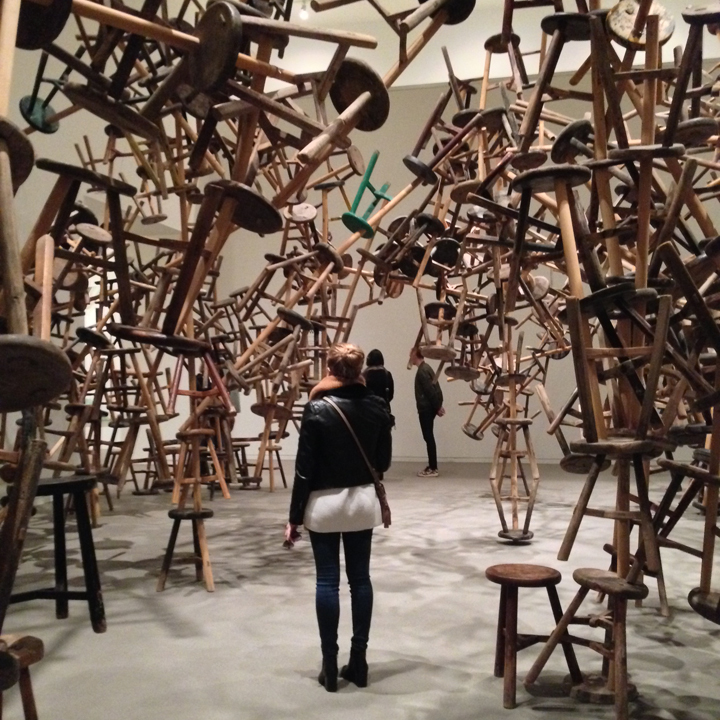 Ai Weiwei’s installation Bang (2011) is built from 886 either authentic or recreated wooden stools that hail from the Qing dynasty (1644-1912). Lui Jianhua’s work Traces (2011) takes up a large, high ceilinged room. Large porcelain sculptures are stuck to the walls of the room, they’re all painted black and look like globs of ink sliding down the crisp white walls. 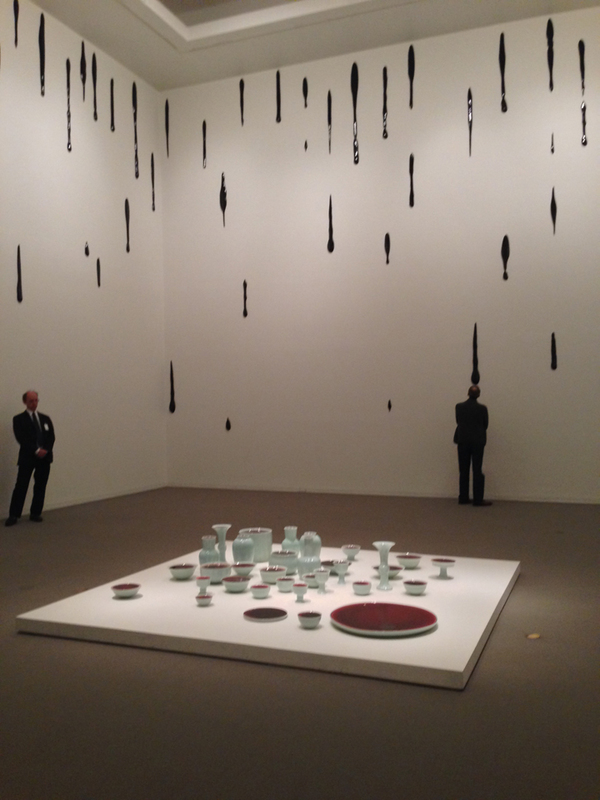 In the center of the room is Jianhua’s other installation, Container (2009) which feature porcelain jugs and bowls all painted to resemble as if they were filled with thick red blood. Finally, Chen Shaoxiong’s Ink Things (2007) is comprised of 70 ink drawings painted on rice paper and an accompanying three-minute video clip that is the same size and shape as the drawings. Unscrolled is not just speaking to the lost traditions of Chinese art and craftsmanship, but rather to all the artisans of the past and how we’ve replaced individual skill for mass production. This exhibit is not dealing with a new subject–consumerism–but rather giving it a new perspective based on Chinese tradition and its contemporary culture. Ai Weiwei’s artwork comments on how the 1960s was a time when consumerism started to really grow; the new was starting to be favoured over the old and inherited. Andy Warhol and Marcel Duchamp were famed for their artworks that commented on much of the same thing, mass production and our relationship to it. Warhol’s Campbell’s Soup Cans (1962) and Marcel Duchamp’s Bicycle Wheel (1951) are both artworks that repurpose everyday things, they elevate them to high art in order to comment on their present culture. Of course this exhibit is also a form of consumption, where we are consuming more ideas and perspectives, which French philosopher Jean Baudrillard further theorizes that consumption is also a form of communication (Jansiz 78). Art is a means of communication, thus whether it be inadvertent this exhibit has a double meaning of both personal and social consumption. Consumerism, thus feels almost inescapable. Unscrolled is not shocking, but instead incredibly relatable. The questions the exhibit poses are simple, but they may be hard to answer. Unscrolled: Reframing Tradition in Chinese Contemporary Art is about acknowledging the importance of tradition and having a conversation with it in the present. Each artist pays homage to some form of Chinese art or craftsmanship from decades past and they understand that times have changed, but that doesn’t mean that it has to be forgotten. Consumerism and its impact stretches across many countries and it’s something that these artists feel are the cause of their culture’s lack of interest in the past. When you walk under and around the stools you can’t help but be caught up in the art and just stare at it. The work is meant to consume you just as much as you consume it, which makes it all the more interesting to experience. The exhibition, for me, did not end after I left the art gallery, which shows a sign of success for the artists’ intent and purpose for these specific artworks.